for SALE at Amazon.com! Kindle Version & Paperback now Available! This is such a beautiful and encouraging book! "This is such a beautiful and encouraging book! Mrs. Brown shows us the world through her eyes and her heart. I am half way through the book right now & can hardly put it down! She talks about being the quiet, fearful, child with learning difficulties and social misunderstandings in a way that warms the heart of a mom who is trying to nurture children with similar circumstances. She weaves together a story that feels like "Pocketful of Pine-cones" meets "Passion and Purity" in a very modern and very relevant manner. I cannot recommend this book highly enough." What an amazing story! Like stepping into Sarah's home! "What an amazing story! Like stepping into Sarah's home and being part of her life and family. She paints the scene and feelings into her writing to draw you right in through the "window". Her love for God and His faithfulness in her life inspires others to hold on to His promises. Powerful strength in the Lord guides this family. An excellent example of how God wants to work in everyones life. I had a hard time putting it down. I will be rereading aloud to my own children. I LOVED IT!" "Windows to our World is a love story—but not just between a husband and a wife. 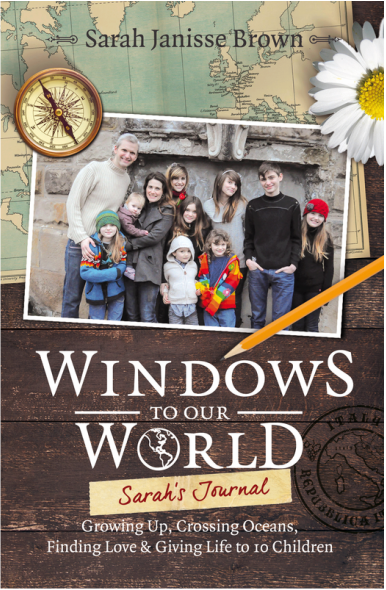 From one adventure to the next, Sarah Janisse Brown tells the story of God’s love for her and how that love led her to an adoring husband, ten talented and creative children, and a life of both settling down and going abroad. 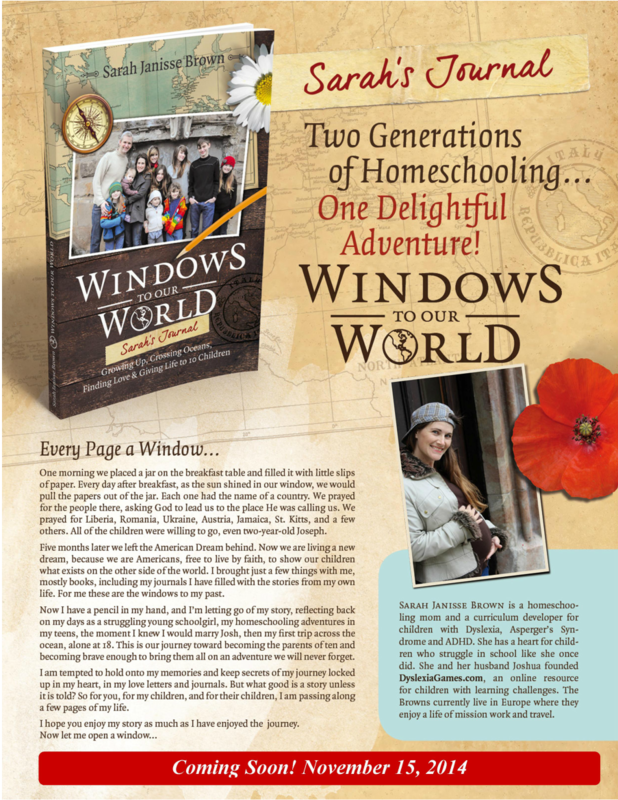 From her early stories about learning to read and building a cabin in the woods, to her first-hand experience with two wars in Eastern Europe, to her family’s appearance on a reality television show, Windows to our World will keep you turning the pages and wondering what the Lord could possibly have in store next for the Brown Family. The journal entries and poetry woven throughout the book also provide a more personal glimpse into Sarah’s inspiration as a wife, mother, artist, home educator, and entrepreneur. Don’t miss this epic adventure story of God’s love and providence in one family’s life." ~ Charity Singleton Craig, co-author of On Being a Writer (Dec. 2014, TS Poetry Press) and editor of Windows to our World.